Welcome Captains to the Buckin' Bronco the Colorado class battleship. The Colorado is the ultimate culmination of the USN Standard Battleship Doctrine and the "All or Nothing" armor concept. This means her armor is focused around her guns and citadel while leaving the rest of the ship lightly armored, this actually has its pros and cons which I'll touch on later. Standard battleships had a standard max speed of around 21 knots with similar maneuverability through all ships, this would allow a battlegroup to operate in unity, not regulate all ships to the speed and maneuverability of the slowest and poorest handling ship. Unfortunately this doesn't translate well to the game since we don't operate in a cohesive battlegroup but more of a "every man for them self" mentality. This ship is pretty notorious for being a terrible ship for which I can understand where most players are coming from, but I find she requires a different play style, a play style that actually teaches you to be a better captain. All things said this is my favorite and most played ship in the game, I grinded her back during her original incarnation and halfway through my grind she got her first buff, mainly to her reload, turret traverse and improved Repair Party consumable. She got a second buff along with the rest of the USN BB line with much needed buffs to their gun range and she just got recent buff to her HP which tied to her improved Repair Party means she print Dreadnoughts. Without further or due lets dive a little deeper into this ship. 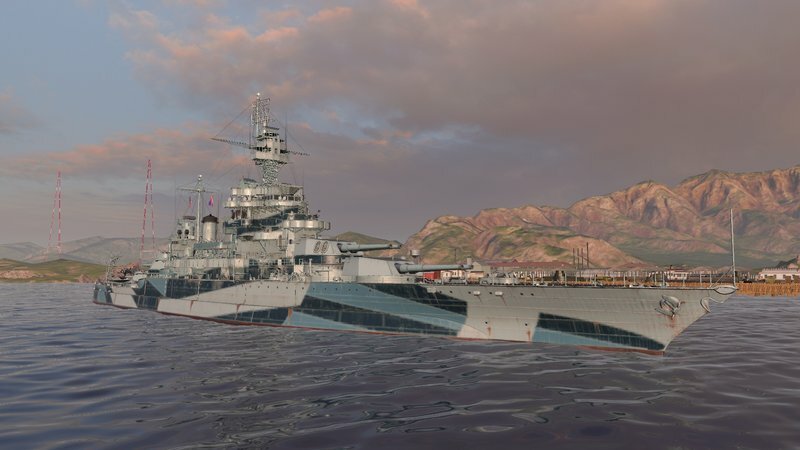 The 'Rado recently got a HP buff bringing her HP up to par with most tier 7 battleships at 59,300 hp and along with her improved repair she can heal a maximum of 13,160hp per charge and a total of 65,800 hp while using appropriate flags and captain skills. While this isn't Nelson territory, it is a great deal better than most battleships and as I said before this ship will print Dreadnoughts. She also has 343mm of armor protecting all four sides of her citadel so when properly angled (NOT bow on, that isn't angling) she will be nearly impossible to citadel. That said she is covered in 25mm of hull plating and 16mm of superstructure armor. This makes the ship a HE magnet BUT this also means most battleship shells will over penetrate, all of which is fully repairable. Proper use of Damage Control is a must in this ship, heck it is a must in every ship honestly. She has great torpedo protection at 37% and mixed with her excellent handling means the 'Rado can easily mitigate torpedo damage as long as your paying attention. 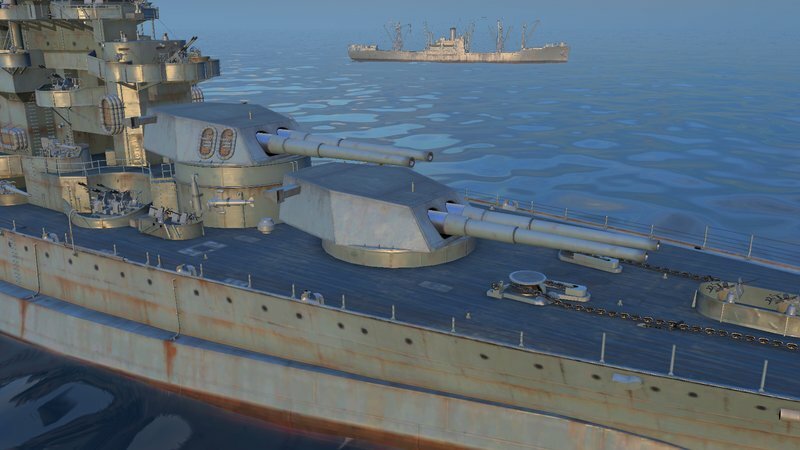 Her secondaries are similar to the New Mexico with a mix of 5"/51 and 5"/25, they are rather low damage but have a good ROF along with good fire chance. She is no Bismark but in full secondary build she is pretty hilarious because what she lacks in raw alpha damage she makes up with starting lots of fires. With Manual Secondary skill I didn't find her all that good at deleting aggressive destroyers but in a brawl with another battleship she will at times burn the enemy from bow to stern. I wouldn't recommend it but it is fun and very unexpected for most opposing captains. The Colorado has ok AA in raw terms but with AFT and BFT skills along with the AA mod and AA flag moves her AA up to a rating of 87. Since she still sees allot of T5 and T6 CVs this means absolutely massacring flight groups, including Kagas (my favorite meals), Saipans and Enterprises. Most CV captains don't expect it and I've been called a hacker and cheater more times by a salty CV captains than any other kind of player. I hate CVs so I run a solid AA build although a Manual AA is a option of your really hate planes like me. Welcome to the last USN BB running at 21 knots, there is nothing that can be said that hasn't been said before. She has a meh rudder shift of 16.1 seconds and rudder mod brings with down to 12.9 seconds, she also has a turn radius of 640 meters. She also maintains good speed while fully turning which makes for a battleship that can't be beat at dodging, but she isn't a cruiser or destroyer, just better than most battleships. This is the area I feel most players struggle with. first mistake I see from most USN captains is trying to sail across the map at the beginning of the match, YOU ARE TO SLOW TO DO THIS!!! Work in the area you start in, if all your allies start to leave, then follow them and act as a rear guard by utilizing your great repairs and hitting enemy ships that make mistakes. Second thing I see is they try to bow tank ships with guns bigger than 14", YOU CAN'T DO THIS EITHER!!! You have 25mm of bow armor, it will bounce 14" or smaller shells when bow tanking but anything bigger will go through. You have 343mm of armor surrounding your citadel in the form of a rectangle, point the corner of the rectangle to the enemy firing at you, this angles your armor to protect your citadel while still allowing you to fire all your guns. Now if the enemy is packing 14" or smaller guns while firing AP then go ahead and bow tank them. That said I like to keep the enemy 13-15km from me, this was the sweet zone for the I found for theguns. In between salvos look at the map, pay attention to last known DD locations and on top of that look at what the enemy is doing AND what your allies are doing. If your friendlies decide to turn tail and run, you need to be right there with them because you will not catch up to them. Use islands to mask your approach or retreat, islands are your best friends so hug them like those creepy otakus hug those creepier anime pillows. Focus on cruisers first, you can tank BB damage better than most battleships if you are angling properly but sustained HE fire from multiple cruisers really adds up, plus getting rid of them lets your destroyers do their thing which is spotting and killing other battleships. Don't try to go off and sail around the big islands if you don't have to, this takes your guns out of the fight longer than other ships. Learning to anticipate what your friendlies and enemies are doing is key and having situational awareness is VERY important. This ship quickly punishes bad moves faster than any other battleship, but if you learn not to screw up this will make you a better captain for other ships because they are more forgiving. Out of 10 battles I saw CVs 40% of the time, I averaged 8 plane kills during those CV matches. I was in Tier 9 matches 0% of the time (this is common for every T7 I play btw), tier 8 30% and I was top tier 70% of the time. I averaged 1430 base XP with my best game was 2212 base XP. My winrate was 80% and I survived 80% of the time with a kill average 2 ships per game. Accuracy was 29% with average damage of 85,679, my best game was 150,988 with a average damage per shell of 2255(meaning every shell that hit averaged out to this number). Please remember this is only out of 10 games, your millage may very! As the slowest ship at T7, well she is slow, but in the grand scheme of things the Nagato and Nelson are not much faster than her especially when comparing the Scharnhorst sisters, KGV and Lyon to them. She requires more skill than the rest of her counterparts, but this skill translate extremely well to other ships. You need to learn to predict what other players are going to do because you don't have the speed to chase. When I finally 'got it' I started to become a better player overall, figuring this ship out was my turning point to becoming a better player. Most enemy players think your a easy mark which makes them over confident, make that over confidence their downfall. Nice write up. Almost makes my want to break out my Colorado again. 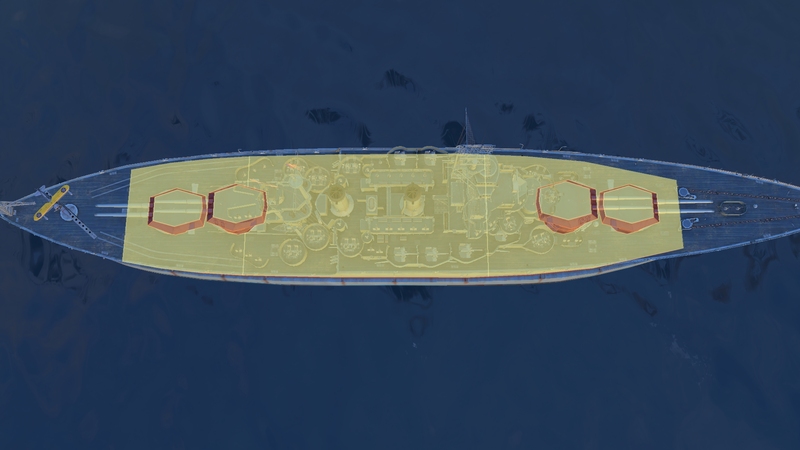 I’m having too much fun with Gneisenau and KGV though at Tier 7. I *really* wish we’d get West Virginia as a Tier 7 premium. I liked my Colorado so much, I kept it's original captain in it and ground it all the way to 19 points. However, that sigma nerf hurt more than you're letting on. 2-gun turrets are already a royal pita for dispersion, and this made it even harder to hit things at the ranges you fight at much of the time. (because your slow speed won't let you get any closer) The "high-low and left-right split" these ships are so frustratingly infamous for is the rule now. I gave up playing mine because of it. Accuracy was really all it had. When you get the opportunity to make a shot, it needs to count. NOT bracket your target, and splash water all over it! He then gets 30 seconds to disappear or angle, or run behind a rock before you can shoot again. Unless he's in another USN Standard, you haven't got a prayer of chasing him down or closing the range if they don't want you to. And if it's a bot, it's already right on top of you before you can reload. I have to agree with the rest of the review, though. Especially from a fellow plane hater like me! My build was more of a hybrid AA/tank, with survivability getting a lot of the captain skillz. I did take both AA mod 2 and AFT, but went for SI and BoS at the 3 point level, and CE was my other 4 point skill. I quite often used the Speed and AA signals on it as well. Contrast that with the new Lyon. Sure, you have peashooters, compared to Colorado and Nagato's 16"ers, and Gneisenau and Georgie's 15" ers- but you get SIXTEEN of them! Those quad turrets really fill out the shot groupings. Even if I do cheese for damage, at least I HIT him, lol. 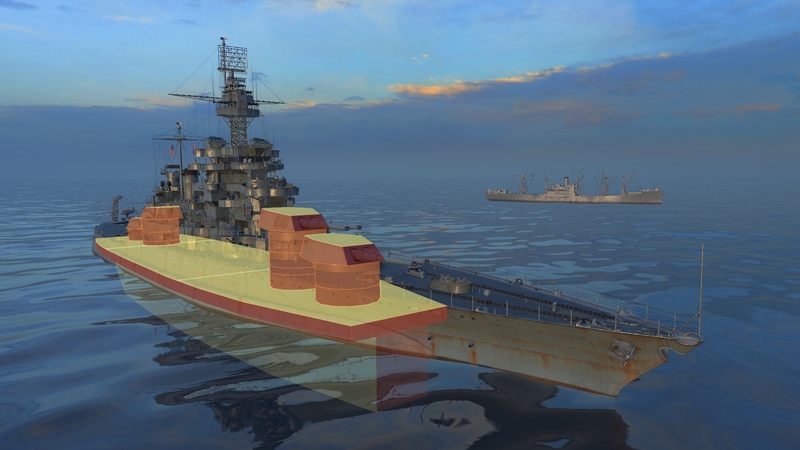 It's completely astonishing just how frequently Lyon simply deletes cruisers with that massive broadside! Smashing Graf Spee's with multi-citadel salvos is also rather satisfying. I can only imagine the salt Lyon players farm in Randoms by doing that, lol. I still miss my 'Rado though... Ended up transferring the 19 point captain to Mahan, since I'm grinding US DD's right now. May as well earn lots of elite xp while I grind! He'll move on to Benson when I get around to playing it. (credits are low due to a massive ship buying spree, lol- and I hate playing stock ships) For now, it's in Sims. Kind of amazing how such a small change can affect a ship so much. They NERFED her sigma to 1.9? ATROCIOUS! I have 397 battles in this ship with 55% WR, 54k average damage, and 1259 WTR and she's one of my best performing BBs. RIP 2.0 sigma, wth WG.